Dawned in Zombie attire, the students and staff have a super fun and safe Halloween party! Our little monsters exhibited some creative talents, some fantastic costumes and stylish jack-o-lanterns and other ghoulish décors. We ended the evening with a special Tim Burton-themed movie night. 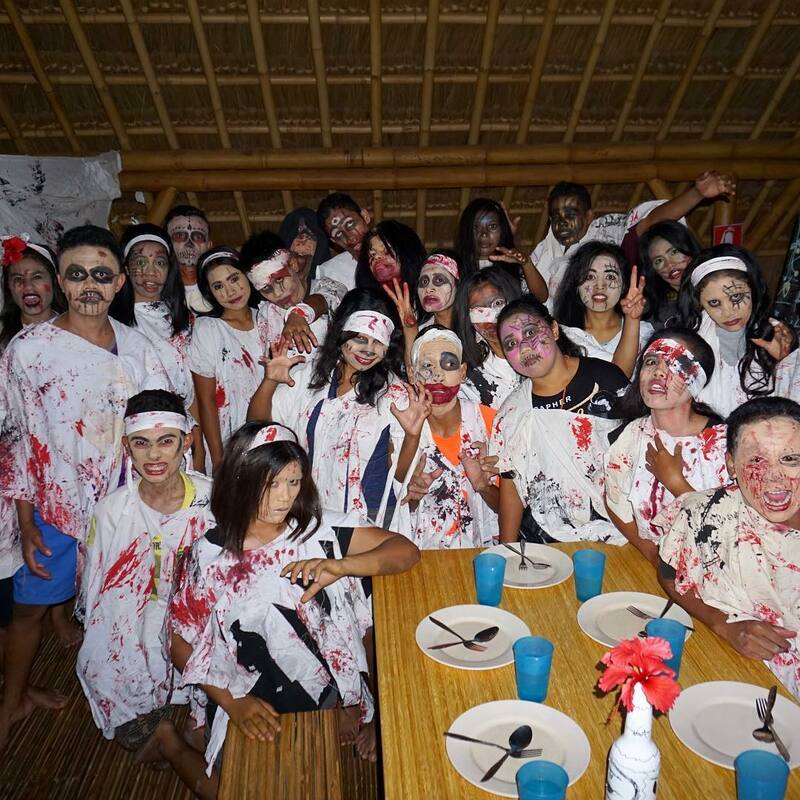 Striped in Zombie-style clothes, students and staff celebrate a very fun and safe Halloween party! Our little monsters show off their creative talents before the party begins with making scary fantastic costumes and stylish jack-o-lanterns accompanied by other dreadful decorations. We ended the night by watching a special film with the theme of Tim Burton. Let the conversations begin! We are always trying to find new ways to engage our students while improving their spoken English skills. October commenced our Friday Night Conversation Club! Much like “speed-dating” (but without “dates”). 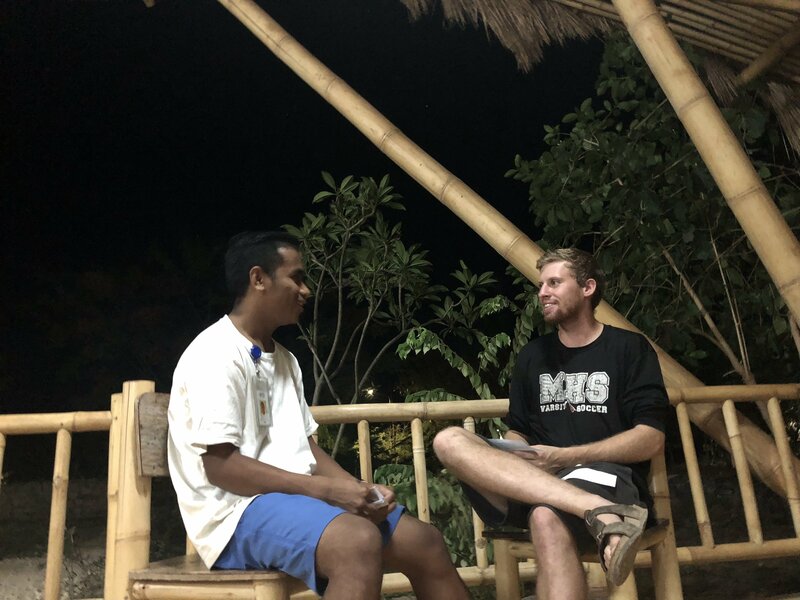 Students engage in short one-on-one conversations with staff members or willing guests of the Maringi Eco Resort. The Club has amazing success so much so that students are asking for daily club meetings. Responding to their requests, Club founder and English Teacher, Judy Edwards, is implementing Conversation Lunches where she engages students in English groups one lunch conversation table at a time; encouraging students, but also with each other. . . in English. They are becoming amazing English-speaking conversationalists! Let the chat begin! We always try to find new ways to engage our students while improving their spoken English. Since October, we started our Friday Night Conversation Club! 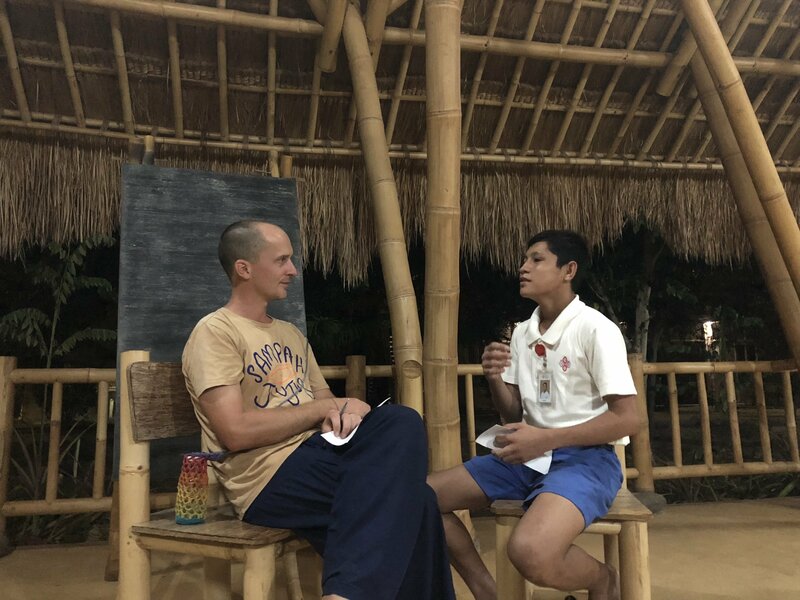 Just like “fast dating” (but without “dates”) our students engage in short conversations with staff members or willing guests from Maringi Eco Resort. The club has had tremendous success so students ask for Club meetings every day. Responding to their request, the founder of the Club and the English Teacher, Judy Edwards, applied Lunch Chat where she involved students in group English conversations, one lunch table at one time; encourage students to speak not only with staff and guests, but also with each other. . . in English. They become amazing English speaking conversation speakers! We continue our amazing partnership with world-renowned, Nihi Sumba’s number one rated eco-resort. Our students have excellent opportunities to showcase their talents and learn new skills. Students continue to travel in groups of four to two weeks to spend time working with and learning from the professionals at Nihi Sumba. We continue our extraordinary partnership with the number one eco-friendly resort in the world, Nihi Sumba. Our students get a good opportunity to show off their talents and learn new skills. Students continue to travel in groups of four to six every two weeks to spend time working with and learning from professionals at Nihi Sumba. The Nihi Sumba cross-training reviews have been amazing. Each of the students gets an opportunity in English for their adventures at Nihi Sumba.Victoria was our first Spa student at Nihi Sumba. Victoria noted that she and the Managers were able to explain the spa treatments to guests in English. We are so proud of our students and feel fortunate to collaborate with Nihi Sumba to provide this amazing opportunity for our students. Review of Nihi Sumba’s cross training was extraordinary. Each student gets the opportunity in English class to share their adventure in Nihi Sumba. Victoria is our first Spa student in Nihi Sumba. Victoria noted that at the end of two weeks other therapists refer to themselves as “Spa Assistant Managers” because only she and the Manager can explain spa treatments for guests in English. We are very proud of our students and feel fortunate to be able to work with Nihi Sumba to provide extraordinary opportunities for our students. In November we sent two groups: First, Delnov (Culinary), Victoria (Spa), Marta (Food & Beverage), Lina (Culinary), and Paulus (Housekeeping) served from November 10-24. 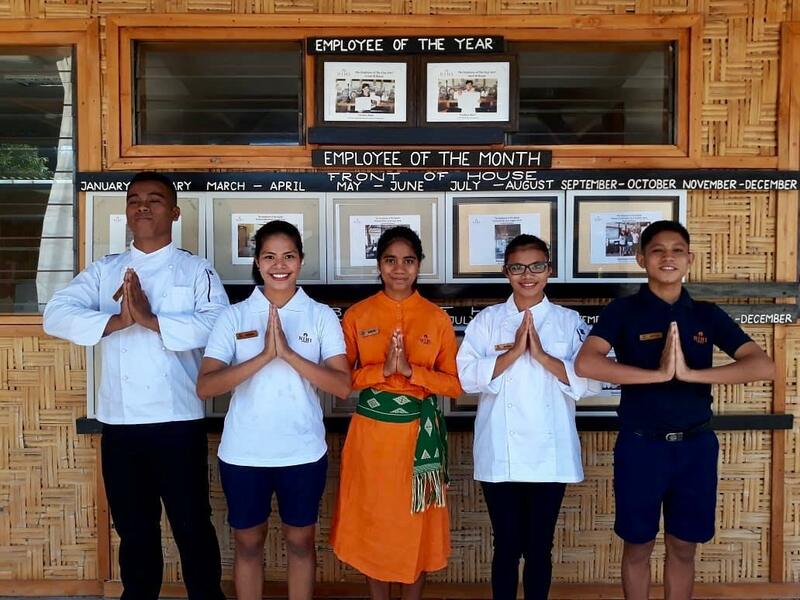 Next, Mike (Front Office), Gasa (Food & Beverage), Abed (Housekeeping), Signs (Food & Beverage), Irul (Housekeeping), and Martin (Culinary) started their service on November 24 and will return December 8, 2018 ; they will be the last group until the New Year. In November we sent two groups: First, Delnov (Culinary), Victoria (Spa), Marta (Restaurant & Bar), Lina (Culinary), and Paulus (Housekeeping) which began on November 10-24. Next, Mike (Front Office), Gasa (Restaurant & Bar), Abed (Housekeeping), Signs (Restaurant & Bar), Irul (Housekeeping), and Martin (Culinary) start their journey on November 24 and will return December 8, 2018 ; they will be the last group until the New Year. 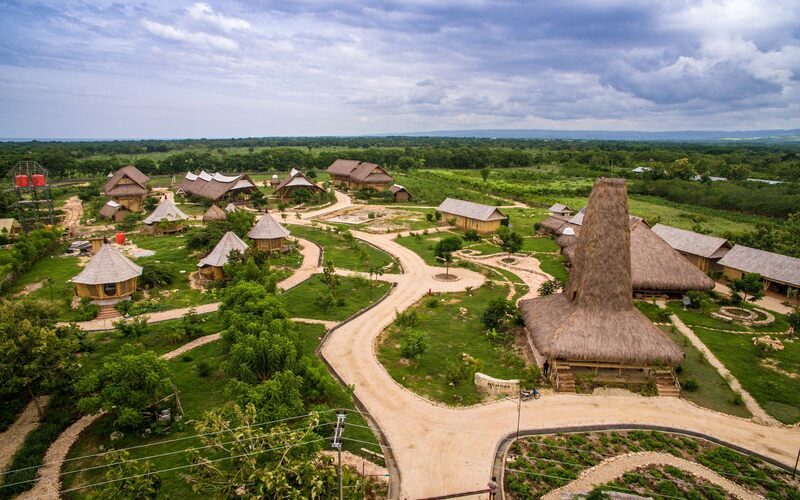 The Sumba Hospitality Foundation is all about sustainability and community service. In that spirit, our students recently joined forces with other groups and businesses near the Kawona Beach. 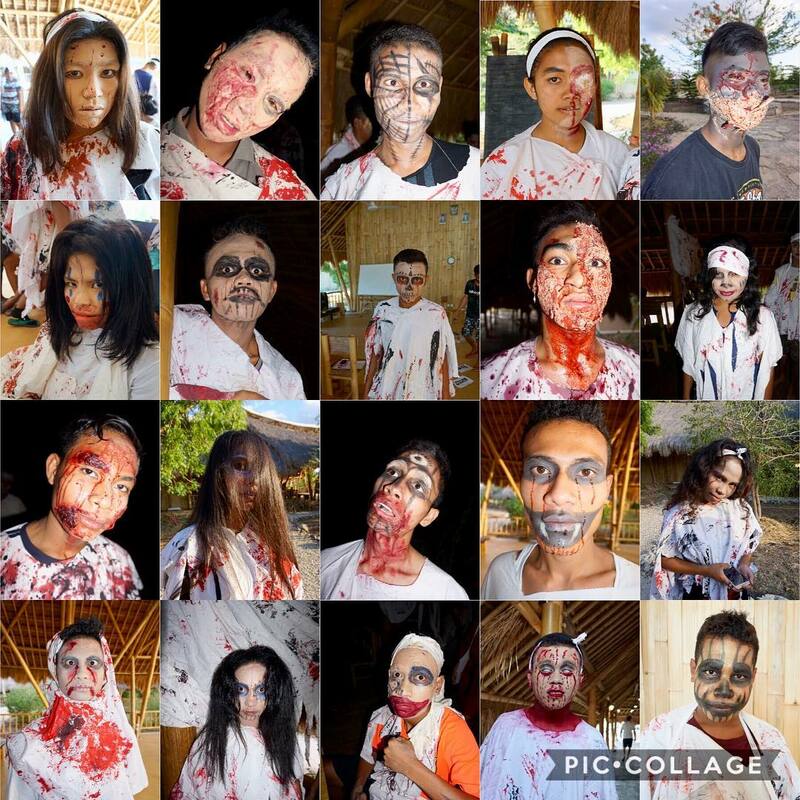 SHF students collaborated with Bakti Luhur Vocational School, the Sumba Tour Guide Association, and Sinar Tambolaka Hotel to restore this local attraction to natural beauty and litter scattered throughout the area. 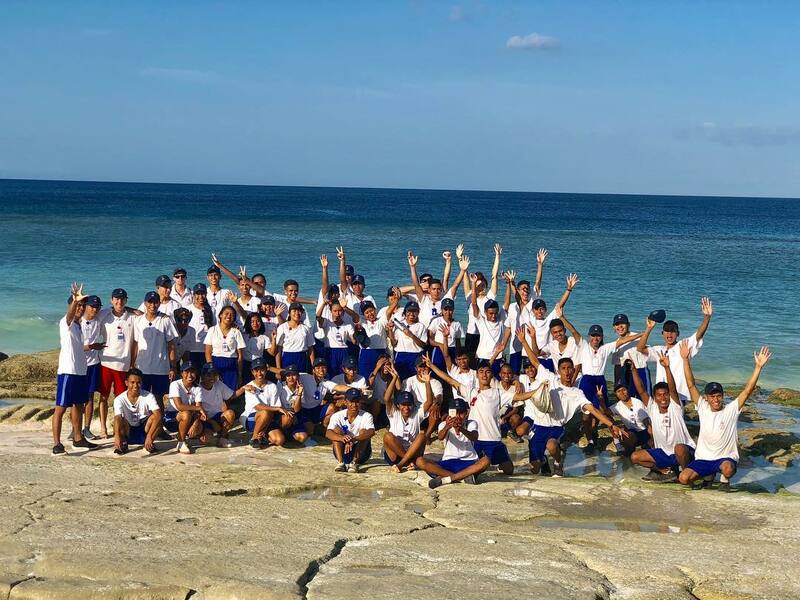 While our students rarely have the opportunity to visit this beach, they have come to embrace their island, their environment, and their local community by the active and active members of the community. 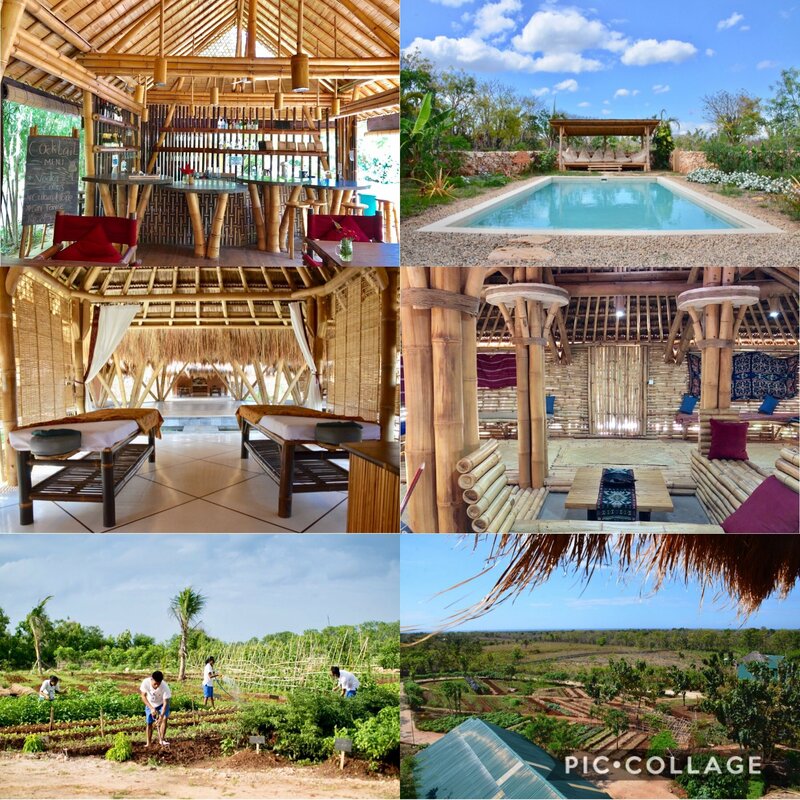 Sumba Hospitality Foundation is all about sustainability and community service. 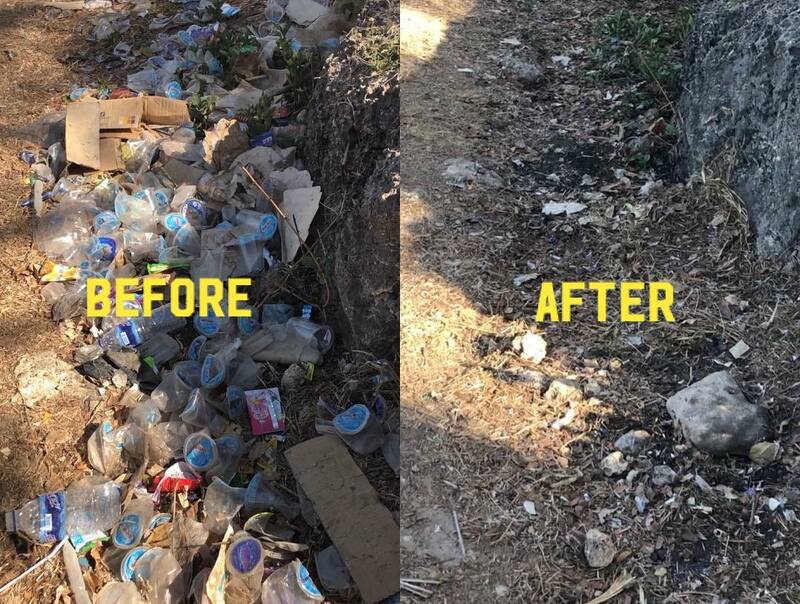 In that spirit, our students recently joined other groups and organizations in the area to clean Pantai Kawona and its surroundings. 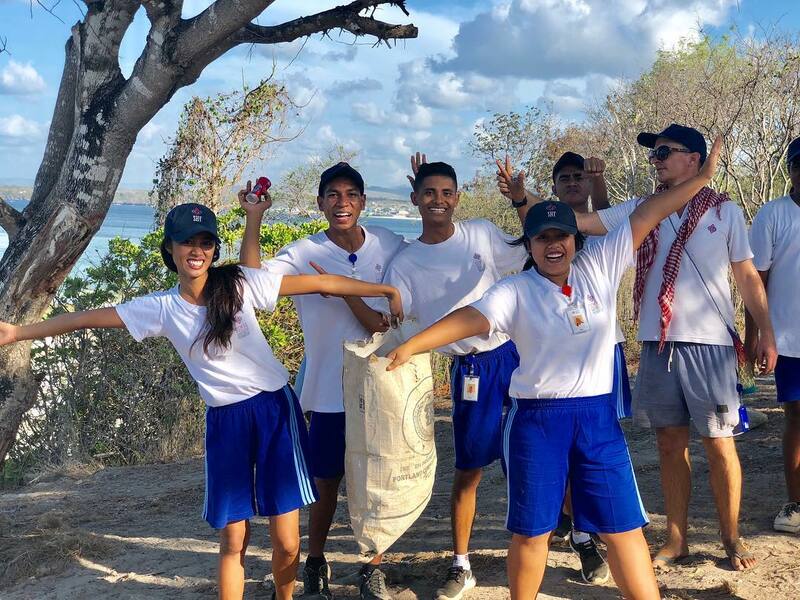 SHF students collaborate with the Bakti Luhur Vocational School, the Sumba Tour Guide Association, and Sinar Tambolaka Hotel to restore this local attraction to its natural beauty by dumping and recycling trash scattered throughout the area. Even though our students rarely have the opportunity to visit this beach, they come to embrace their island, their environment, and their local community by becoming responsible and active members of the community. The students are currently studying for their final examinations will complete the second term December 14, 2018. Students will return for the third term on January 7, 2019. the results. As a result, many students will take a break to serve the Maringi Eco Resort, which will remain open throughout the holidays. Students are studying for their final examinations will complete a second term of office December 14 2018. Students will return for the third of the four periods on January 7, 2019. We are at the halfway mark and cannot be more pleased with the results. As our break between terms one and two, many students will sacrifice their holidays to serve at Maringi Eco Resort which will remain open during the holidays. The holiday season approaches, we are delighted to announce that we are offering an exclusive seasonal package for guests at our amazing Maringi Eco Resort. The December 24-28 th holiday package includes a special rate for accommodation, an exclusive dinner, Christmas celebration with students, and much more! If you are looking for a unique holiday adventure, book your stay with us now via telephone (+62) 82236615505 or by email at: reservations@sumbahospitalityfoundation.org. Christmas is all about giving a better way to celebrate the spirit of the Maringi Eco Resort season by the Sumba Hospitality Foundation. You will also enjoy an amazing holiday, you will also improve the lives of our students. And ahead of the holiday season, we are pleased to announce that we offer exclusive seasonal packages for our guests at our amazing Maringi Eco Resort. Holiday packages from December 24-28 include special rates for accommodation, exclusive dinners, Christmas celebrations with students, and more! If you are looking for a unique holiday adventure, order your stay with us now by telephone (+62) 82236615505 or by email at: reservations@sumbahospitalityfoundation.org. Christmas is about giving and there is no better way to celebrate the spirit of the season than at Maringi Eco Resort by Sumba Hospitality Foundation. Not only will you enjoy an extraordinary holiday, you will also improve the lives of our students. Your holiday plans are already set, we are booking well into 2019. . . consider making a New Year’s Resolution to pay it forward in 2019 with a holiday at the Maringi Eco Resort in the New Year. We offer an amazing experience unlike any other here at the Maringi Eco Resort by the Sumba Hospitality Foundation. And if your vacation package has been set, we will place an order until 2019. . consider making a New Year’s Resolution to pay for it in 2019 with a vacation at Maringi Eco Resort in the New Year. We offer an amazing experience like no other here at Maringi Eco Resort by the Sumba Hospitality Foundation. Not only do we offer amazing accommodations, including both Deluxe Guest Rooms and Bamboo Pavilions, we are so much more. Our guests are important part of our students’ progression; lifting them out of poverty and into successful careers in hospitality. Our Resort provides a platform for our students to practice theories they learn in the classroom. Not only do we offer exceptional accommodations, including the Deluxe Room and Bamboo Pavilion, we are much more. Our guests are an important part of the development of our students; lift them out of poverty and into successful careers in hospitality. Our resort provides a platform for our students to practice the theories they learn in class. Our Deluxe Guest Rooms showcase our unique and environmentally-friendly bamboo infrastructure and innovative design, together with providing an overall wonderful guest experience. Our deluxe guest houses offer a king-sized bed or twin beds, an open air bathroom, fan and air-conditioning, and an adjacent swimming pool with poolside bar / kitchen and meeting room with amazing daily breakfast in our exquisite restaurant, all for only IDR 1,500,000 per night. 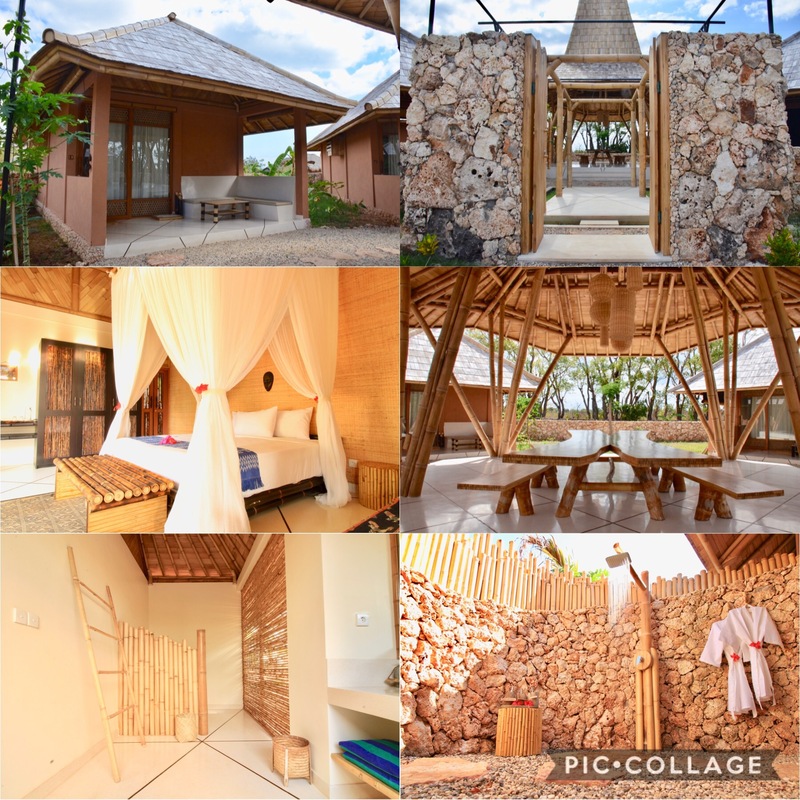 You also have a king-sized bed, an open air bathroom, fan and air-conditioning, use of the pool, poolside bar / kitchen and meeting room, and daily breakfast for only IDR 1,000,000 per night. Our Deluxe Guest Rooms feature our unique and environmentally friendly bamboo infrastructure and innovative designs, along with cleanliness and comfort that provide an exceptional guest experience overall. Our deluxe guest house offers a king size bed or twin beds, in an open air bathroom, fan and air conditioning, and the use of an adjacent swimming pool with poolside bar / kitchen and meeting room along with a superb daily breakfast at our room is a beautiful restaurant, all for only IDR 1,500,000 per night. 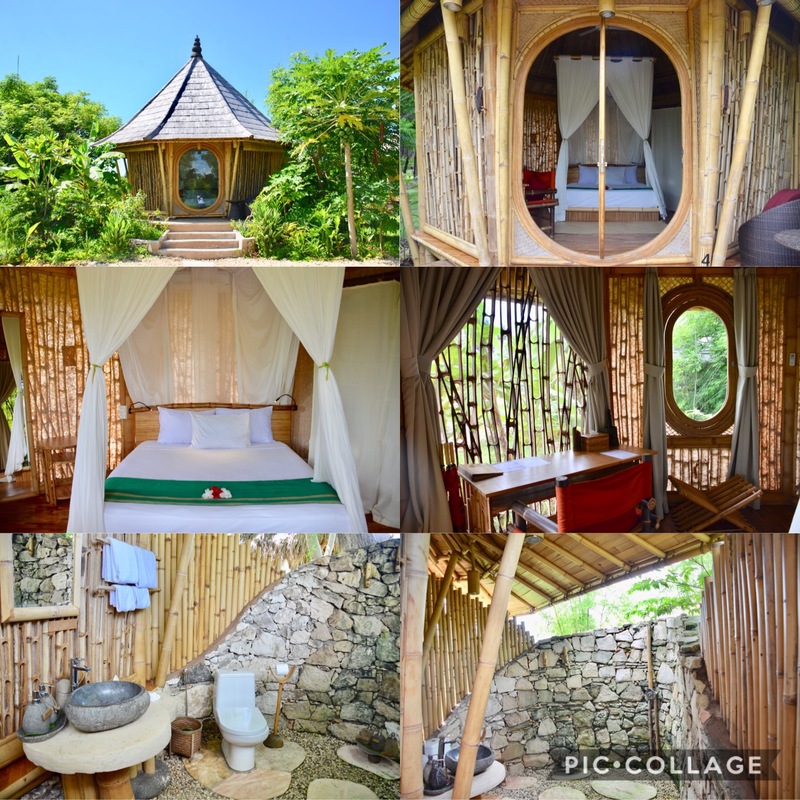 Our Bamboo Pavilion also offers you a king-sized bed, in an open-air bathroom, fan and air conditioning, use of the swimming pool, poolside bar / kitchen and meeting room, and daily breakfast with only IDR 1,000,000 per night. Both accommodations are accessible to our amazing daily and lunch restaurant serving dinner and dinner Monday to Saturday. Our restaurant offers amazing culinary treats with a set menu which may be offered to meet your culinary desires providing a mix of local and international dishes composed of fresh, sourced organic ingredients directly from our gardens and orchard. Both accommodations are easily accessed by our superb restaurant which serves breakfast daily and lunch and dinner Monday to Saturday. Our restaurant offers exceptional culinary offerings with a set menu that can be changed to fulfill your culinary desires by providing a mixture of local and international dishes consisting of fresh organic ingredients sourced directly from our garden and permaculture gardens. Also, our new and exciting enjoyment is our amazing spa offering a menu of relaxing massages and body treatments to enhance your health and well-being.There are available free airport and other local transport services, arranging tours for local villages and traditional villages, free use of bicycles – ride to a beautiful crystal blue water, powdery white sand beach, opportunities to meaningfully interact with our amazing students and international and local staff, and much more. Join us for a holiday like no other. For reservations, please contact our Guest Relations Manager atreservations@sumbahospitalityfoundation.org . Also, newly opened and available for your pleasure is our fabulous Spa offering a menu of relaxing massages and body treatments to improve your health and well-being. And other guest services available include free airport and other local transportation, arranging local attractions and traditional villages, free bicycle use – with a beautiful ten-minute trip to the beautiful crystal blue waters, white sandy beaches, the opportunity to interact meaningfully with our outstanding students and international and local staff, and more. Join us for a vacation that is second to none. For reservations, please contact the Relations Manager Our guest at reservations@sumbahospitalityfoundation.org. 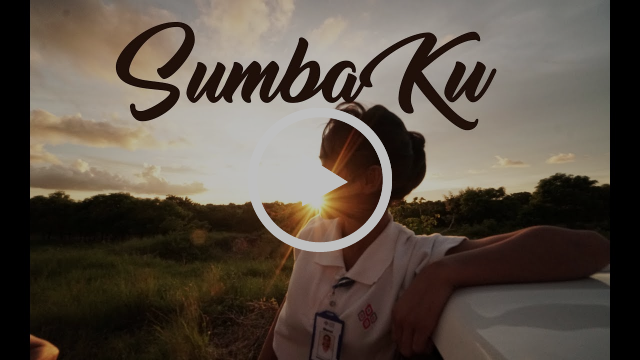 This month, we would like to showcase a documentary trailer for the creation of the album “Sumba Ku”. The producer, Rizal, has sincere heart in the making of this socially conscious album and at SHF are supporting him fully!